Is art an object or a process? Is it \"material\" or \"trace\"? Shifts in art practice over the past 50 years, particularly in art world centers in Europe and the US, and more recently in Canada, Australia, and New Zealand, have profoundly challenged Enlightenment to modern conceptions of the work of art, in European aesthetics, defined as an object, more or less static in meaning and value over time. Material Traces presents work from the past fifteen years by artists from around the world which draws on the legacy of performative intermedial practices from the 1960s and 1970s to foreground the processes and materiality of making, whether in wood, paint, performance, video, or other media. In this way the work in Material Traces stresses the interrelational bonds between art makers and viewers. The emphasis in the exhibition is on works that foreground aspects of making, activating aspects of temporality, in order to connect in conceptual and material ways to viewers at a later time. By activating future viewers, these works have the potential to create historical bonds with past contexts and agents, and thus to elicit political thought in the present. Amelia Jones is Professor and Grierson Chair in Visual Culture at McGill University in Montréal. Her recent publications include major essays on Marina Abramović (in TDR), on feminist art and curating, and on performance art histories, as well as the edited volume Feminism and Visual Culture Reader (2003; new edition 2010). Her book, Self Image: Technology, Representation, and the Contemporary Subject (2006) has been followed in 2012 by Seeing Differently: A History and Theory of Identification and the Visual Arts and her major volume, Perform Repeat Record: Live Art in History, co-edited with Adrian Heathfield. She has curated exhibitions and events on feminist art, queer visual culture, and faith and identity in visual culture, among other things, including her flagship show Sexual Politics from 1996 at the UCLA Hammer Museum. Motorcycle performance (2008) documentation for a two-bike lanesplit of Auckland`s Northern Motorway during morning rush hour traffic. The semi-illegal continuous passing maneouvre was from Greville Rd onramp, over the Aucland Harbour Bridge to the city exit. The bikes are a Ducati 996s (front bike) and a Suz u ki GSXR 600 (rear bike). The bikes cut between the fast lane and medium lane, riding the centre line to continuously pass rows of commuting cars and trucks. The footage is continuous (no cuts) onboard footage from each bike - rearward onboard filming from the front bike, and frontward filming from onboard the rear bike. 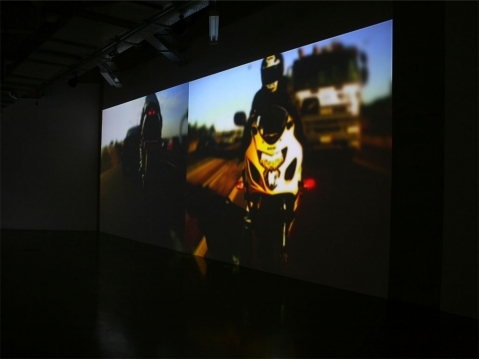 Both video cameras record the semi-illegal commuter passing maneouvre simultaneously, and these recordings are installed in the gallery as a dual channel synchronised video installation with stereo sound.